This lovely Ande bag is in great condition! 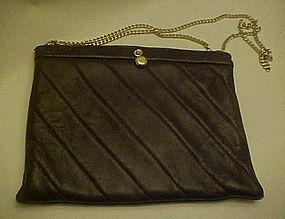 There are awesome details including the diagonal pleated look on the front side of the purse and a smooth backside. Very dark chocolate brown color with shiny gold hardware. Matching brown gross grain fabric lining. The gold chain may be worn long, short or tucked away inside to be used as a clutch. Approx 7" x 9 1/2". Top snaps open and closed. Has spring tension steel inside the top edges for a neat tight closure, and quick access. Very nice used condition. No pockets or partitions. Simple, chic and functional.